It’s an amazing accomplishment to survive testicular cancer. It’s an even more amazing one to survive four other kinds of cancer. And then to finish an Iron Man triathlon after doing all that? Could be described as superhuman. Meet Welsh truck driver David Fletcher, who has conquered Hodgkin’s Lymphoma, skin cancer, testicular cancer and germ cell cancer twice over the course of his 39 years. Fletcher might be unlucky in medicine but he’s lucky in love – with the support of his wife and two children, he’s conquered every diagnosis he’s been given and battled cancer into remission. Part of that can be credited to his incredible physical health. The marathon runner ignored doctor’s orders to stop working out while he was recovering, and it seems to have worked out for him. 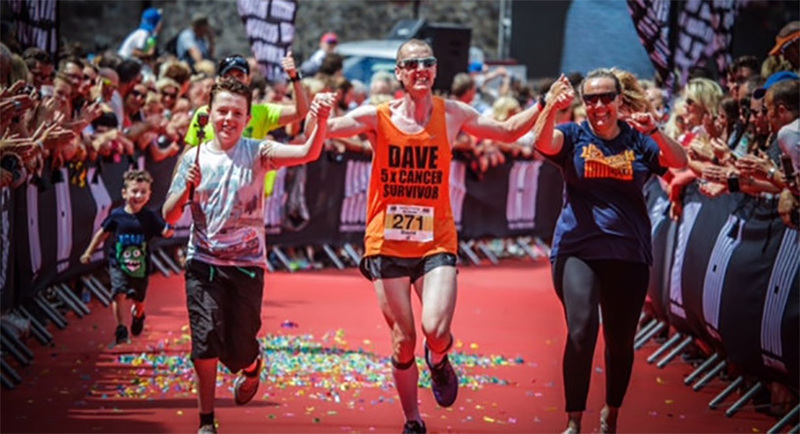 Last week, David Fletcher crossed the finish line of the Long Course Weekend Wales 2017 triathlon – that’s a 2.4 mile swim, 112 mile bike and 26.2 mile run. That happened just nine months after his last operation to remove germ cell cancer. That’s an unbelievable accomplishment for a perfectly healthy man, let alone one who has gone through that kind of medical trauma. This guy is a true badass and we salute him.